The National Petroleum Council (NPC), a federally chartered and privately funded advisory committee, was established by the Secretary of the Interior in 1946 at the request of President Harry S. Truman. In 1977, the U.S. Department of Energy was established and the NPC’s functions were transferred to the new Department. The purpose of the NPC is solely to advise, inform and make recommendations to the Secretary of Energy with respect to any matter relating to oil and natural gas, or to the oil and gas industries submitted to it or approved by the Secretary. The NPC does not concern itself with trade practices, nor does it engage in any of the usual trade association activities. The NPC is chartered by the Secretary of Energy, under the provisions of the Federal Advisory Committee Act of 1972. The Council membership of approximately 200 persons is selected and appointed by the Secretary of Energy. Individual members serve without compensation as representatives of their industry or associated interests as a whole, not as representatives of their particular companies or affiliations. The study plan was organized around two key themes: Prudent Development in the Arctic and Arctic Research and Technology. The first theme provides context on Arctic development experience, resource potential, regulatory practices, and the ice and sea environment in general. The scope of the Prudent Development section is broad and includes a discussion of both global and domestic ice environment, experience, practices, and development potential and challenges. This section also provides insight as the federal government takes on global leadership roles in the Arctic. The Prudent Development theme provides the necessary foundation for the more forward-looking Arctic Research and Technology chapters on emerging research opportunities, technology development, and collaborative approaches applicable to prudent development in the Arctic. The scope of the Research and Technology chapter analyses also includes important assessments of the human and ecological environments. A key element of the plan was the recommendation that the study’s research and technology analyses would focus on the needs for exploration and development of conventional offshore resources. This recommendation was made because onshore technologies and experience were more mature and, in light of the tight study timeframe, the focus should be in the area with the greatest needs and opportunities. The members of the various study groups were drawn from NPC members’ organizations as well as from many other industries, state and federal agencies, nongovernmental organizations (NGOs), other public interest groups, financial institutions, consultancies, academia, and research groups. More than 250 people from over 100 organization served on the study’s Committee, Subcommittee, and Subgroups or participated in the Technology Workshops. 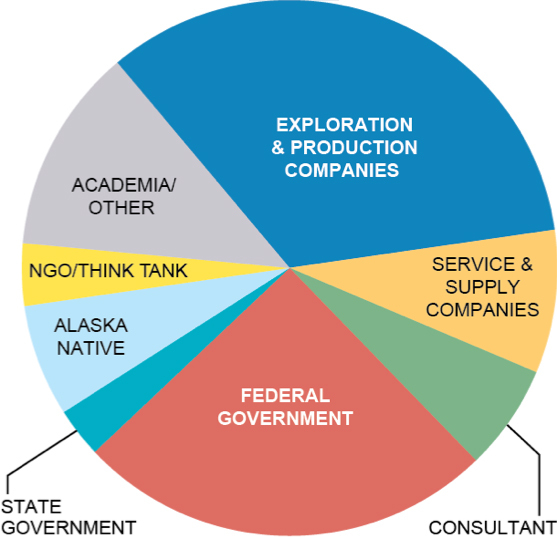 While all have relevant expertise for the study, less than 45% work for oil and natural gas companies.